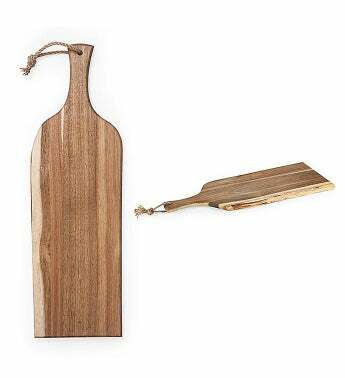 Presentation is key, and with the Artisan Serving Plank, you're more than half way there. The sleek, acacia-wooden plank is a gorgeous addition to any kitchen island, camper counter, or anywhere where there's food and a good time. Care Instructions: Surface wash only with a damp cloth. To prevent wood from warping and cracking, do not submerge in water. To prevent wood from drying out or cracking, occasionally rub with food-safe mineral oil. Not dishwasher safe. Dimensions: 24" x 8" x 0.8"